I know I know, there are very few Twilight fans on this site (that’s why I heart you so much), but since The Twilight Saga: Breaking Dawn Part 1 is coming to theaters this Friday (November 18) I have to at least mention it. Taylor Lautner has been doing interviews nonstop for the promotion of the upcoming flick and according to him, we’ll be seeing a whole other side of Jacob. “It was really exciting for me, because Jacob in this movie is very different than he ever has been, so I was a little nervous. I was excited,” he said. 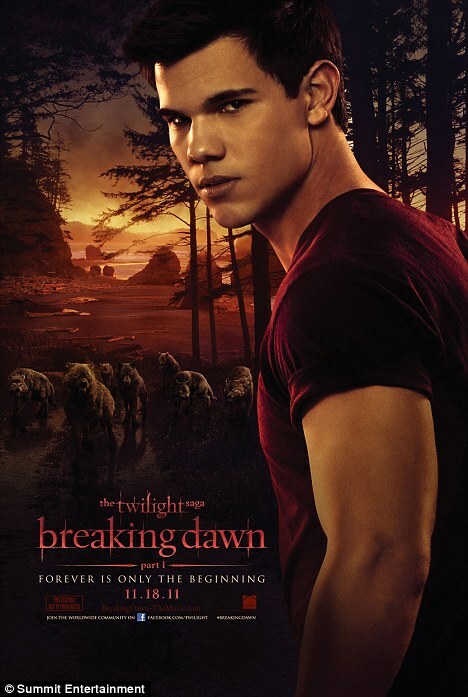 For Lautner, Breaking Dawn was a chance for everyone’s characters to show another side of themselves, but he admitted that he struggled a bit with Jacob. For those of you new to the story, in Breaking Dawn Jacob is forced to decide where his loyalties lie – to Bella and her unborn vampire child or to his wolf pack, a very grown up decision for a lil’ teen werewolf to make. To see what Jacob does check out Breaking Dawn Part 1 this Friday… or you know, just read the book. So, who here is planning on catching this movie?